The eating-out culture has gained tremendous momentum over the years. People have become very adventurous in their food choices and experiment with different cuisine styles from across the world. While this in itself is not at all a bad thing, what too much of extraneous influences do is that they overshadow local identity. The decor of this restaurant was inspired by this thought. A contemporary styling manages to interest patrons more; and is necessary to draw them to the F&B outlet over and over again. As a result, rural materials and objects are seen woven into the contemporary fabric. 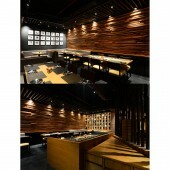 In a restaurant the sensory perceptions of the space dominates the level of appeal. With simplicity as the primary guiding factor, an earthy look was chosen and splashes of bold colors were introduced through various elements such as traditional local artifacts, displays and merchandise. A cleverly designed lighting pattern enhances the divine experience generated through organic components like wood and stones. The overall experience though quite emotive, showcases Indian regional culture and philosophy ingeniously, without compromising on the functional and visual factors. Programmatically the restaurant is divided into two sections. The lower section at the entry hall has couple seating separated by low height exposed brick masonry of interesting bonds. The upper section is raised by a step; with seating designed to cater to larger groups. Ceiling is painted black to give the effect of having dinner under the twinkling stars in an open courtyard of a rural house. 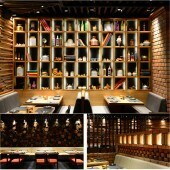 The restaurant is a fusion of traditional elements with a contemporary design as a base. 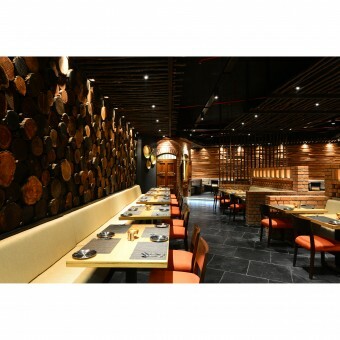 It gives an international look and encourages even the expats in the city to experience the regional cuisine. The project started in May 2013 and Finished in September 2013. Location: Seasons Mall, Magarpatta, Pune, Maharashtra, India. Emphasis was given on the use of Local materials and the traditional construction techniques. Exposed brick work with wire cut bricks and creative use of bonds of construction highlights central portion of the restaurant. Vertical elements of walls are cladded with wastage and recycled wooden stripes and the raw wooden logs symbolizing ancient stone masonry structure in rural India. Flooring again is leather finished black local stone (Kudappah) used in construction of Old Dravidian Architecture. 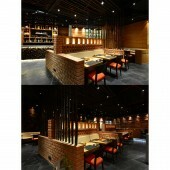 Total area of the restaurant including kitchen is 255 Square Meters. with the height of 4.8 M.
Very often, Indian Regional Cuisine restaurants use Indian motifs and design elements in the decor. Here the attempt is to take out only essential extracts from Maharashtrian regional culture and infuse the otherwise contemporary styling with a touch of rural Maharashtra. 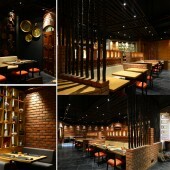 The fusion of earthy and contemporary extends a very different experience for the patrons. Restaurant decor is a highly challenging area of design. The aesthetics chosen need to appeal to the patrons and stay fresh and interesting over time. As designers, we try to add value by sharing the benefits of our experience and expertise with the client. The decor was based on the concept of creating a sense of nostalgia in the local patrons’ minds subtly; without letting the cultural overtones overpower the space. Hence the base for the styling was chosen to be contemporary; with certain elements lending the nostalgic touches, to create an overall delightful dining experience. 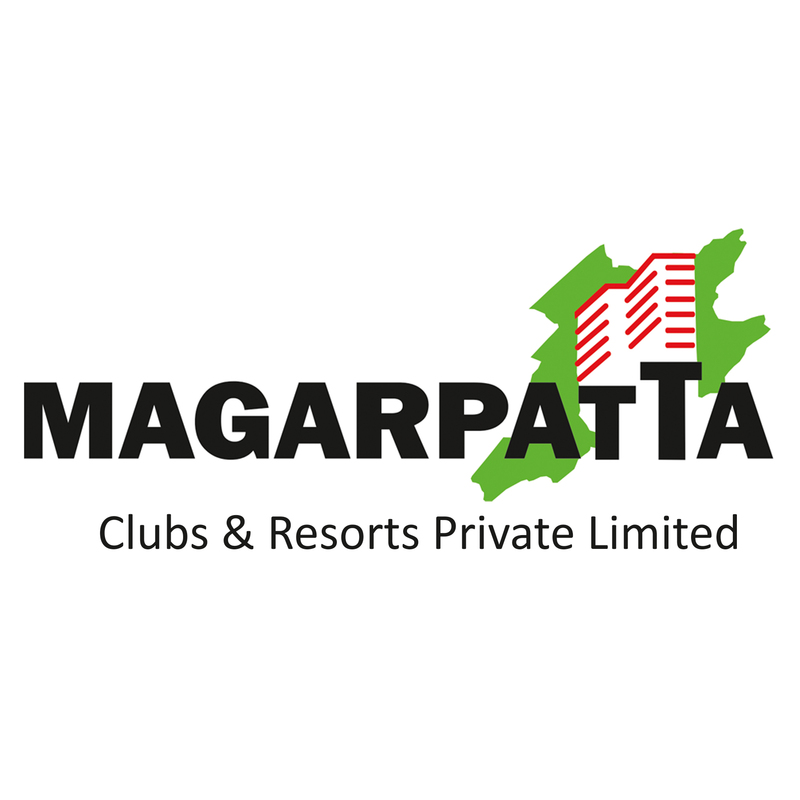 Magarpatta Clubs and Resorts Pvt. Ltd.
Wah Marathi Restaurant and Bar by Ar.ketan Jawdekar (studio K-7) is a Nominee in Interior Space and Exhibition Design Category. · Click here to register today inorder to be able to view the profile and other works by Ar.Ketan Jawdekar (Studio K-7) when results are announced. Wah Marathi Restaurant and Bar by Ar.ketan Jawdekar (studio K-7) is Winner in Interior Space and Exhibition Design Category, 2013 - 2014. · Read the interview with designer Ar.Ketan Jawdekar (Studio K-7) for design WAH MARATHI here. · Press Members: Login or Register to request an exclusive interview with Ar.Ketan Jawdekar (Studio K-7). · Click here to register inorder to view the profile and other works by Ar.Ketan Jawdekar (Studio K-7). Did you like Ar.ketan Jawdekar (studio K-7)'s Interior Design? Did you like Wah Marathi Restaurant and Bar? Help us create a global awareness for good interior design worldwide. Show your support for Ar.ketan Jawdekar (studio K-7), the creator of great interior design by gifting them a nomination ticket so that we could promote more of their great interior designs.